After many decades a story recently surfaced that meant a great deal to my mother. She had known nothing of the event but its restoration emphasises the necessity of telling stories, of sharing personal anecdotes and of avoiding the dull sadness that comes with being the only soul left who recalls a happening. One evening more than forty years ago my mother's parents were driving home from the city, where they worked daily, and had just begun their journey. Tom, a fellow from their village who also worked in the city was waiting with thumb extended for a passer-by to offer him a lift; like most in Ireland in those days he had no car and relied on the kindness of strangers- or neighbours. In any case, on the particular day in question, he saw his familiar neighbours coming from a distance. My grandfather was a notoriously slow driver and so Tom was astonished when the pair passed him by on the road- they were deep in discussion and did not see him. It was not too long, however, before somebody did stop for poor Tom and soon overtook my grandparents' laggard car. It was the custom to take a passenger as far as possible and drop them at some point so that they could get a lift with the next passing car. Tom waited by the roadside, hoping that my grandparents would soon pass by once more. Indeed they did, but just like before the two did not look up and for the second time sailed past an astounded Tom. He got another lift a few minutes later and the driver took him another length, again passing out his lumbering and oblivious neighbours. I hardly need tell that it happened again: Tom, poor fellow, was subjected to a third overlooking when the next driver took him as far as he could and Tom watched my grandparents go past without seeing him. Eventually Tom succeeded in reaching a petrol station a couple of miles from home- there, at last, my grandparents caught sight of the stranded Tom and invited him into their car. Tom might never have divulged the whole tale but for the fact that my grandfather, as soon as the car began to roll, candidly said, "I nearly missed you there, Tom." Tom could contain himself no longer. "Paddy, you passed me three times already." At which point all three roared with laughter and did not stop laughing all the way home. The story is slight, but its resurrection is immeasurably significant to my mother, who knew nothing of it, and perhaps to Tom, too, who possessed it and carried it unshared for forty years or more. He has passed it on, as did Mater, as do I. When Tom met Mater in the village some months ago and insisted he had a fond memory of her parents that he wished to narrate, he was demonstrating a powerful element- one that goes far beyond providing temporary entertainment and brief laughter. What was lost is no longer lost- that is the magic and the beauty of sharing stories. 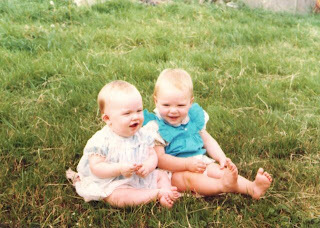 I just wanted to add here: this is my favourite photo of myself as a baby- I'm with my cousin who is the same age, and I love this picture for the obvious closeness between us. I always thought one of us must have been telling a very good story when this was taken. The only caption I could think of was "listen closely..."
Your little icon picture gives us no visual clues as to which baby might be you...so...hmmmm....I'm a lefty. I'm gonna guess you are the little sweetie pie on the left? Your stories always leave me with a nice warm feeling. Thanks for sharing. What a delightful story. That just cracked me up. Sometimes reading your stories is like watching a great old movie. They are very visual and complete. As to which baby is you? Well both are adorable so even if I guess wrong, I still pick a cutie. I think you are the little charmer in the blue dress/outfit. Jaime, glad to make you laugh out loud :) And, sorry, but you were wrong- so close, and yet so far. I'm in blue, on the right. Barb, that's always good to hear- thank you! Steve, I greatly enjoy comments like this. Thanks. Texican, I'm glad it brought a laugh! Thanks to Mater for this tale of a long journey home. Yes, you are a little charmer, I'm sure, in whatever color you or Mater decide. Your little baby face is making me smile! We have an Irish friend, and he is full of stories. This was a great one, and so happy it was shared.